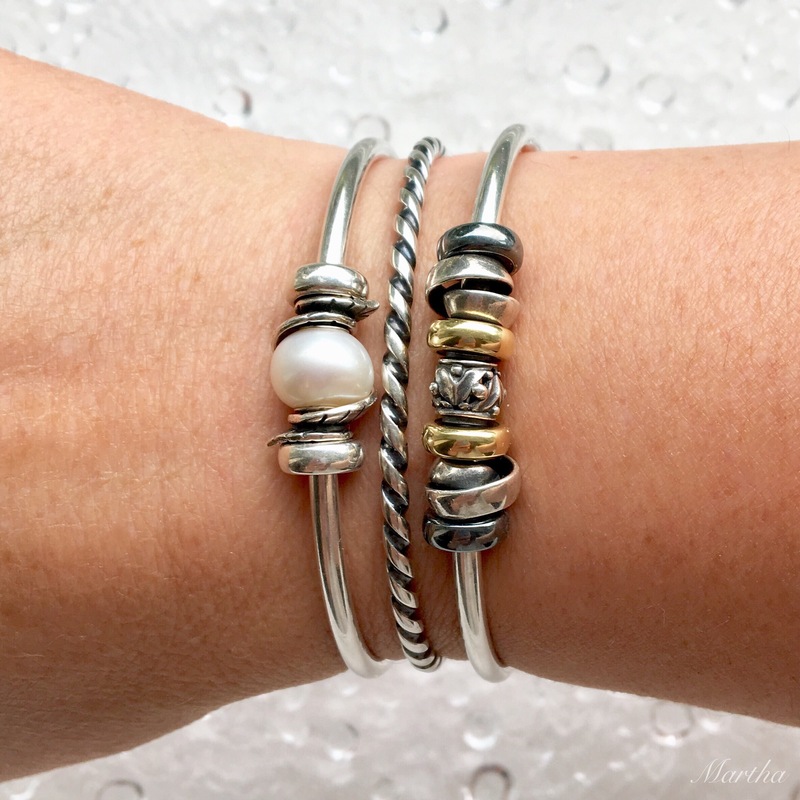 Bead collectors are always inspiring me and last week I wanted to try some combos using small silver beads after seeing a lovely bangle on @am4ndabeads15’s (Amanda) Instagram. She used the copper bangle and small silver beads and it just looked delightful. A while back I did a blog post on using Spacers to create different looks, like this one. For today’s looks I’m using four different finishes of the non-decorated Spacers (otherwise known as stoppers). I have silver, gold, copper and oxided ones. Then, I’m adding in an assortment of small silver beads. 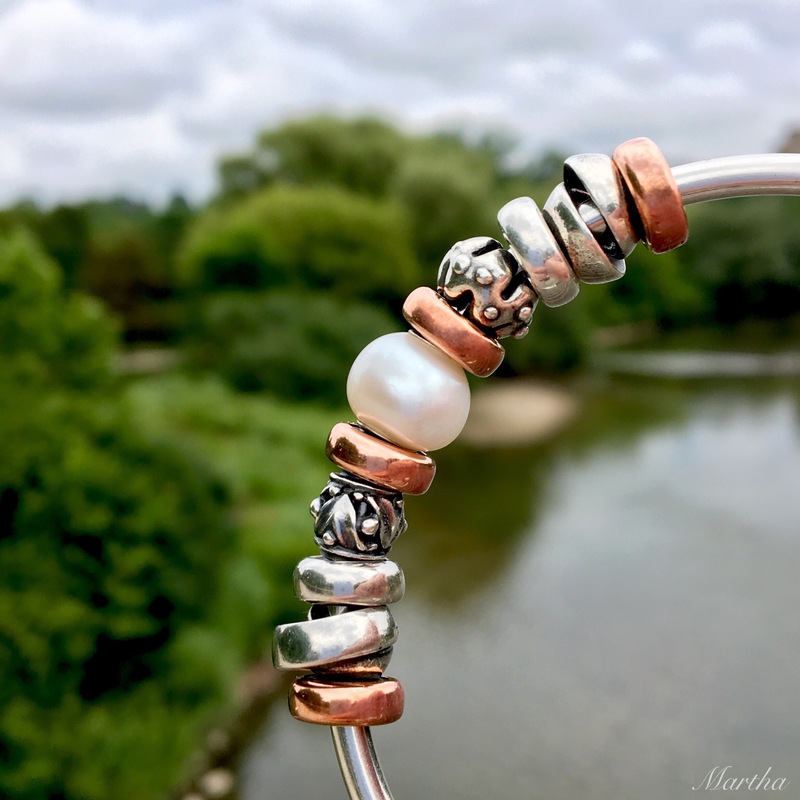 The first bangle uses a pearl in the middle, four copper spacers, two silver spacers, two Neverending beads, Pumpkin Ornament near the top and Rhythm Drum near the bottom. I really love Rhythm Drum! Now, let’s add in a copper bangle with two Hourglass beads. These came out with the spring collection, Kindred Spirits, but were a bit overlooked, I think. They look great on leather bracelets as you can then see the leather through them. In the middle is a Planet Bead, Small. To beef up the combo and add some texture, I put on a twisted bangle in silver and a plain silver bangle. One small silver that is not on the pink background photo is Social Circle, because I was using it elsewhere. It’s one of my favourite beads and I did a blog post on it here. 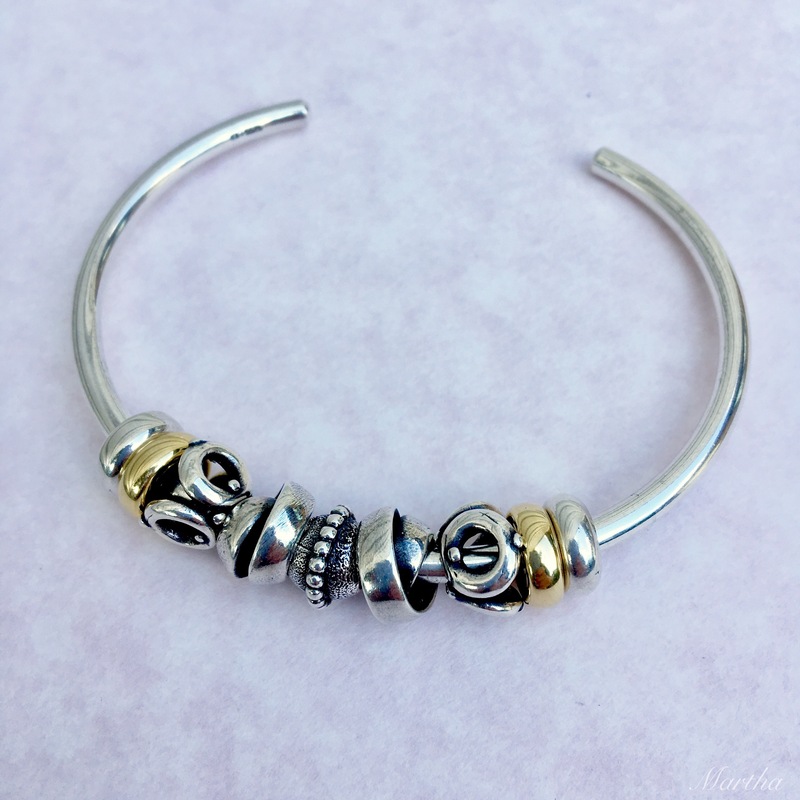 This bangle uses two Social Circles and two Neverendings. Imagine how many different ways this bangle could be rearranged! 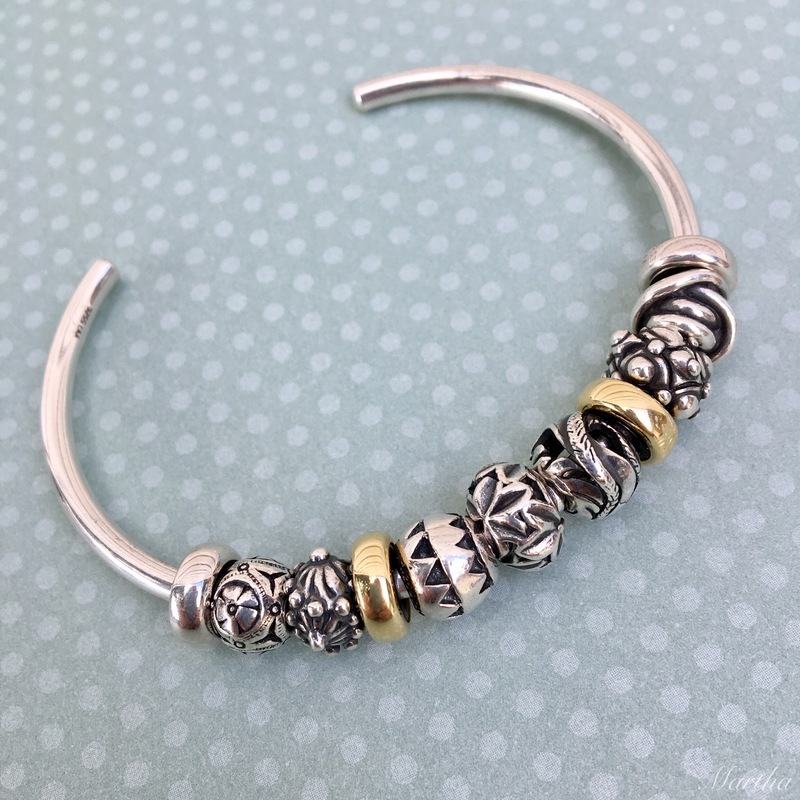 This bangle uses quite a few of the small silver beads. Left to right they are the one that came with the Feel Good Bracelet, Quiet Flower Bead, Aztec, Wisdom Weed (which should be paired with the Ohm Beads Green Crack 😳), Freedom Feather, Bumpy Ride and Lucky Knot. Laura (@evepink123) has multiples of Lucky Knot and it looks amazing when she uses them all together! Finally, I’ve used the pearl again in the middle with two Spring Leaves surrounding it. On the bangle on the right Rhythm Drum is in the middle with two Neverendings. 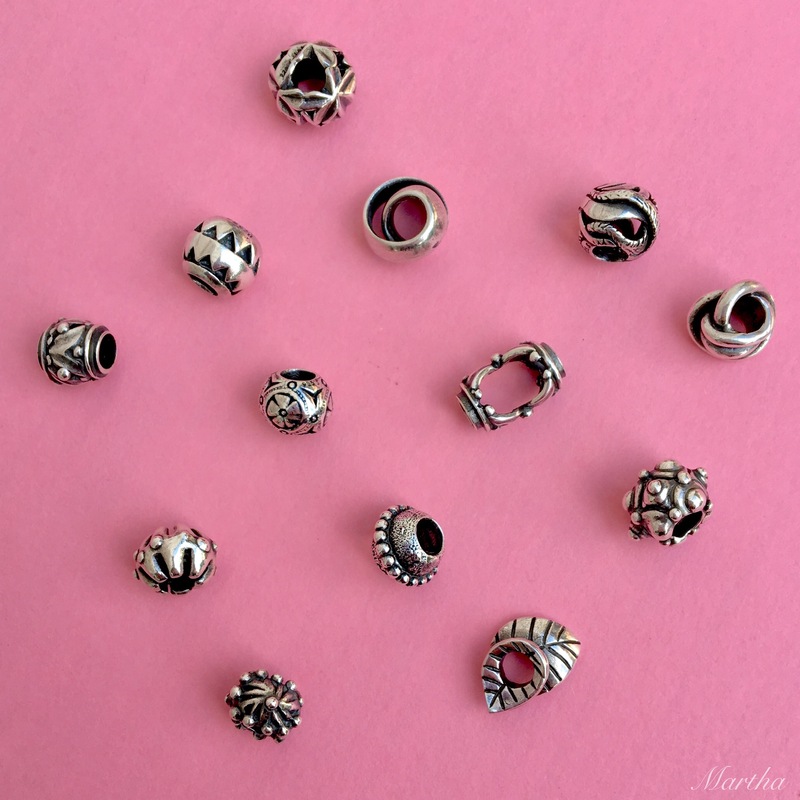 So, I’d love to hear about which small silver beads you like. And anytime, feel free to direct message pictures of your bracelets to me on Instragram or post them to my Facebook page. I love to see other people’s bracelets. The next blog post will be on Pandora Disney Muranos, just because I’m excited for you guys abroad who will be getting the collection in your countries in the fall. 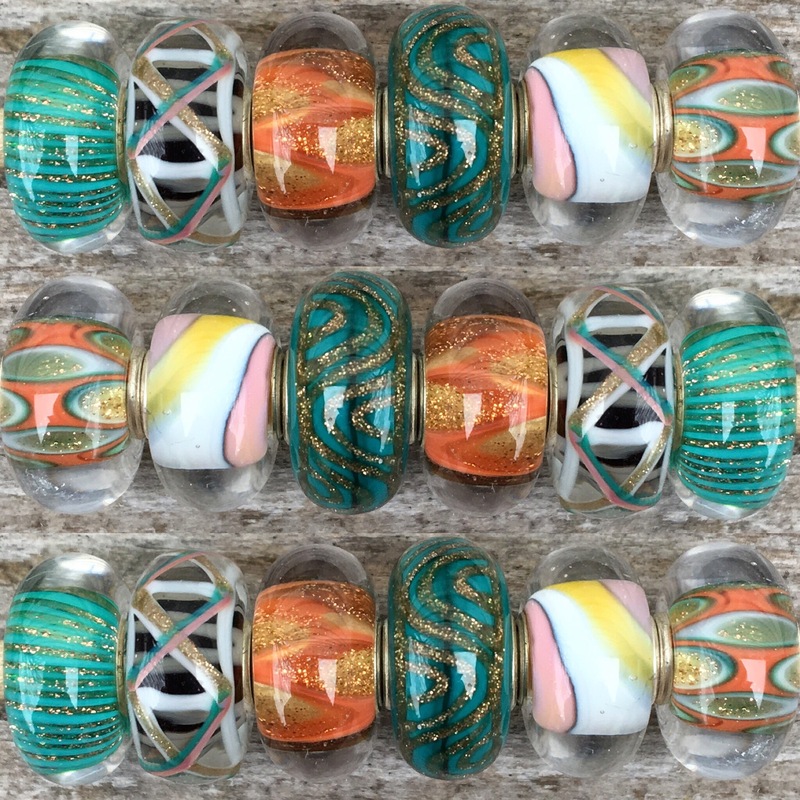 Then, it will be time for some of the Redbalifrog Woodlands Collection and I will put together a Live Image Preview of the next Trollbeads collection, like I’ve done in the past. I can’t wait to make another triple row photo like the one from the Kindred Spirits Collection! Hi Martha, I love this! I love every bead, every look you’ve done here, with the slight possibility of the Hourglass beads on the copper bangle being my favorite. I need a lot of beads and spacers before I can do this but that’s okay…oh and some bangles too! 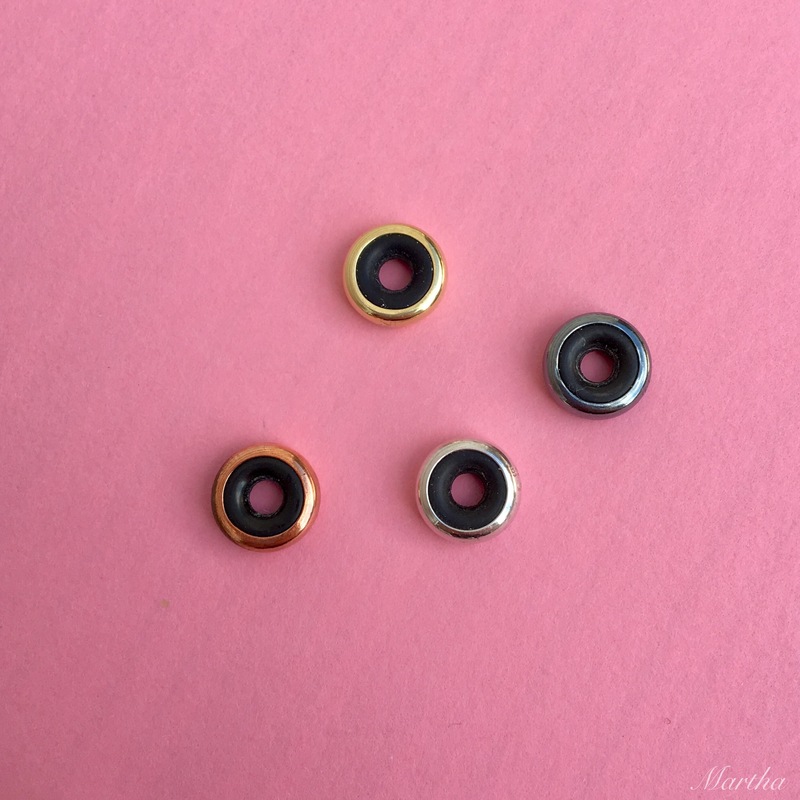 And Gold Spacers! Hi Suzanne! I was just having coffee with my friend who also said she needs some Gold Spacers. 😀 They add so much to a bracelet and are so versatile! I really had a lot of fun making up these combos, so I’m glad you enjoyed them! As your collection grows you will be able to do it, too. No rush! Hi Alex! LOL! Yes, I will keep my blog appearance like this for a while, as I quite like it now. I will look up the Pandora Groovy as I’m not familiar with it. I’ve really been enjoying wearing these bangles the last few days. I’m going to try to keep one together for a while as it’s great for doing a grab and go! I just absolutely love ALL your ideas. 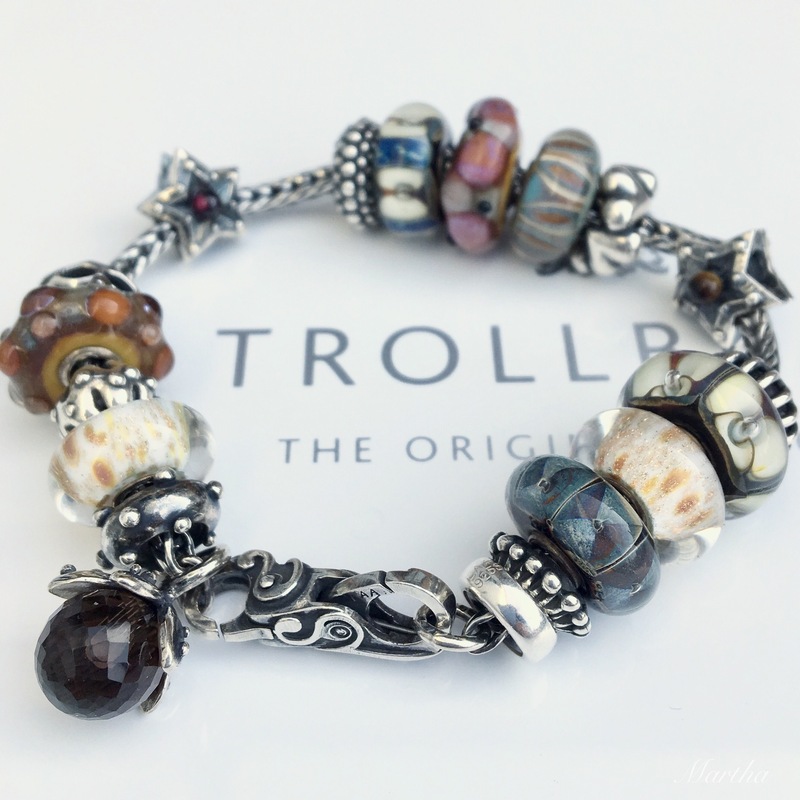 Such welcome Trollbeads inspiration to incorporate! Thank you. Thanks for reading and commenting, Linda. Glad you liked the combos! These bangles are sooooooo pretty! You did a fantastic job in cooperating each bead. Thank you for walking us through how to build our own bangle, truly helpful. Thank you, Ashley! It’s so much fun to try different things. I’m glad you like them! 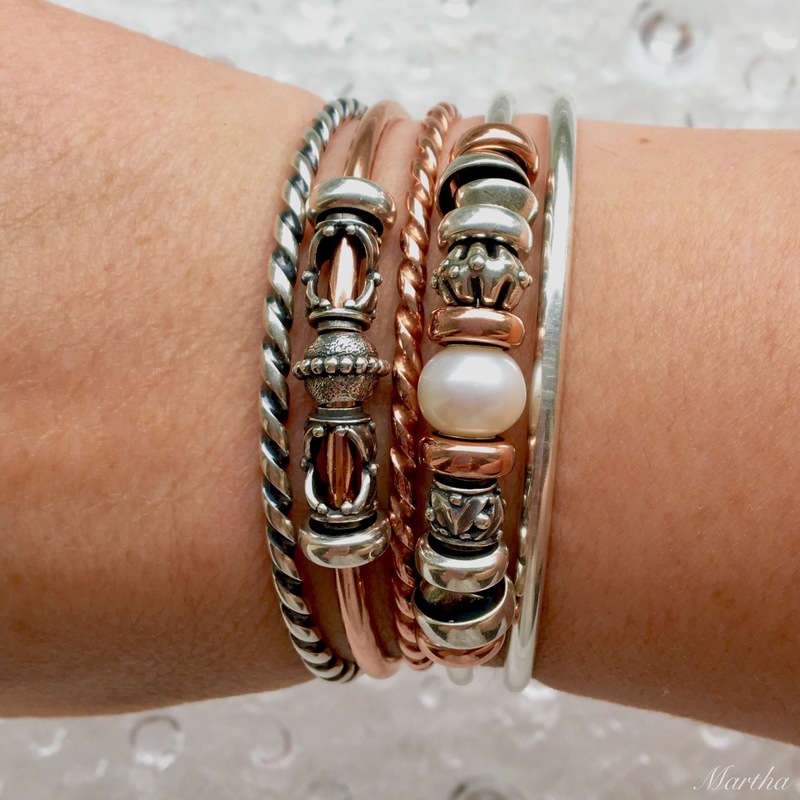 I love all of these bracelets Martha! They are really pretty- I think I need some more small beads. I never considered the Rhythm Drum or the Hourglass beads or the Social Circle beads before, but I think I need to get some – at least being small they are the least expensive beads! I love your bracelets, but I don’t know too many people who have enough doubles of the smalls or enough spacers to pull it off. But very pretty! My pleasure, Amanda! I always love seeing your combos! We are all bad for each other. Laura has me wanting multiples of Lucky Knot, but thankfully it’s the lowest price category. Hi Martha. I was just looking at your Beads’n’Coffee bracelets on Instagram. On your friend Cheryl’s bracelet , could you please tell me what the name is of the dangle she’s wearing? It looks like twisted vines on it. Not only do you entice me with your own designs; Martha, but I find myself looking at everyone else’s wonderful bracelets! Maybe it’s best I can’t figure out Instagram…. I would have too much to say!!! Thanks Martha! For some reason I couldn’t even get past the Username. Everything I tried, it said it was already in use… even ridiculous combinations of letters and numbers. So I gave up. My son said that I will only end up with a bunch of stuff I don’t want anyway. LOL! I totally understand. I’m happy I was able to put my Instagram feed on my blog at least. That was a major accomplishment for me, ha ha ha! 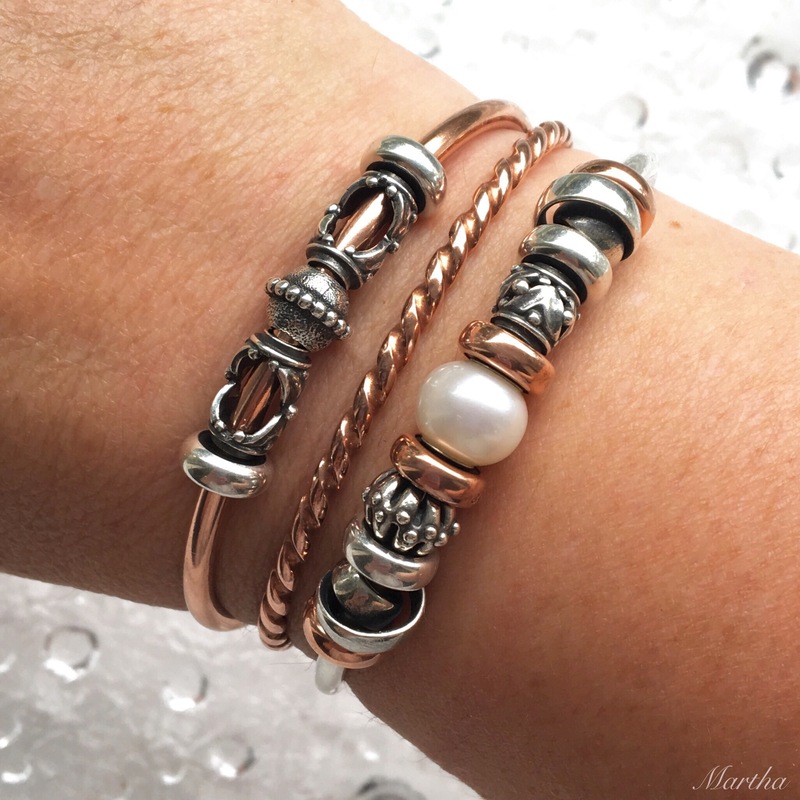 I soooo love your amazing bracelet combos, Martha! You have such a knack for putting together the most amazing designs! I still don’t near have enough beads to do this, but you make me dream! Thanks Audrey! Yes, this is after many years of collecting plus a year of product samples! Love all of your combos! At one point, I had a plan to make a bracelet entirely from small silvers. There is definitely something about them – perhaps that they have to capture the idea and detail in such a small space? Tracy, there were so many silver beads in the spring collection that it was so easy to overlook the small ones. I think sometimes there is a ‘star’ of a release that gets more attention than the other beads and so the other ones kind of lay low. The nice thing about the smaller ones is that they are usually the cheapest!